Lab Supply now carries a huge selection of Kong Toys that work great for a variety of animals, including canines and primates. Kong Toys are great because you can combine play time with treat time. You can stuff treats inside of the Kong Toy which works to prevent boredom among the animals and also give them a reward for play time. 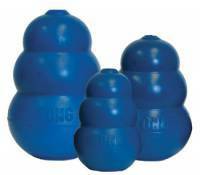 Lab Supply carries Kong Toys in a variety of shapes, sizes, and colors so that you can find the best toy for your pet. If you would like more information on this toy, then please click here to view the product page.